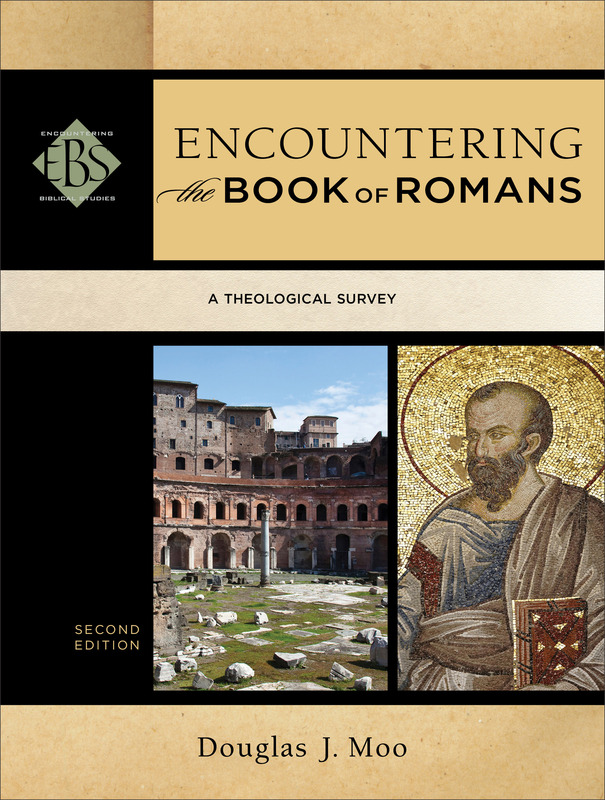 Encountering the Book of Romans is laid out like a textbook, with an attractive layout, wide margins, and tables, illustrations and maps. Each chapter begins with an outline and objectives, and ends with a few study questions for retention and to consider the information further. Throughout each chapter are inserts that either pursue a rabbit trail of sorts or develop a point in more detail. There are 26 vocabulary words (such as diatribe or corporate solidarity) that appear throughout the book in bold font and with the word repeated in the margin to draw attention to the fact that a definition is in the back. This helps expose students to new concepts without burying them in scholarly lingo. Moo introduces the reader to Romans in 16 pages over two chapters. The first chapter familiarizes the reader with ancient letters and a brief history of how Romans has been understood, particularly by the Reformation and New Perspective readings and their key players. Moo does an admirable job of boiling down the debate in two pages. Fundamentally, critics of the Reformation view find fault in an individualistic reading and in the portrayal of first-century Judaism as legalistic. Moo accepts these criticism as “somewhat justified” and proceeds to take a “modified Reformation approach” (p9) throughout this book. The majority of the book is then devoted to surveying the sub-units of Romans. Moo breaks the letter down into 7 parts (all beginning with “encountering” in the title), fowling a fairly standard structure. Within each part are a few chapters averaging to 12 pages each. Each chapter is like a mini-introduction/commentary on the unit, summarizing and explaining the contents. When it comes to debatable issues, such as the identity of the “I” in Romans 7, Moo presents a list of simplified options, but certainly moves forward with his own conclusion. Though Moo is fair to these views, he is not a detached observer. This comes through in his comments on Romans 9:6-13, where he introduces the Calvinism/Arminianism debate. He deftly makes the arguments plain, but concludes that despite Arminian arguments have a point, “I do no think that they can succeed in overturning the usual Calvinist interpretation of these verses…the issue is, finally, about the salvation of individuals.” (p135). After this statement, he moves on; though making his view clear, by no means does Moo force the issue. Moo’s prose is ordered and clear, though not overly winsome. However, while Moo may be accused of being dull, he is certainly never careless. He is a reliable and level-headed guide to the letter, and depending on the reader this will delight or tire them. On the topic of accessibility, the images are all top-notch in quality, however the book is grayscale. Colour would certainly have been more inviting to students. After reading it for myself, I used this with my Romans students in this Spring (2015) semester at CCBCY. My class consisted mostly of North American and European students from various religious backgrounds, averaging in the early 20s. While some students complained that it was “difficult”, “dry” and “dense” at times, others said it “stretched” them and was “helpful” for preparation by giving them the big-picture of the section before our in-class lecture. 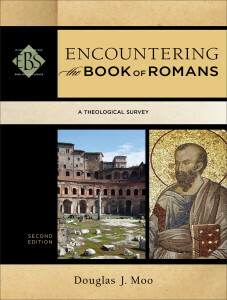 Encountering the Book of Romans does what it says on the box, batteries included. It is a textbook theological survey of Paul’s letter, written by one of the ablest Pauline scholars and author of arguably the greatest modern commentary available. While it would be a fine introduction to Romans to the earnest reader, it is best used as a textbook for undergraduate students. Many thanks to Baker Academic for providing a copy in exchange for review. Their generosity did not affect my opinions of this work.